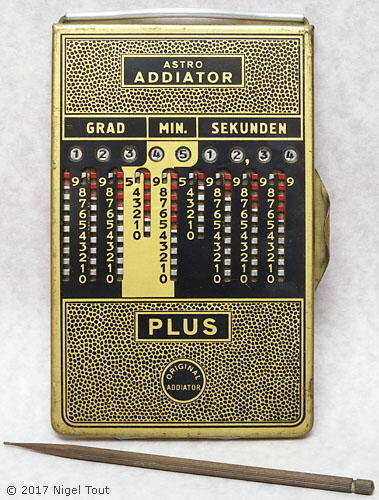 This stylus-operated Addiator is designed for addition and subtraction of angles in degrees-minutes-seconds or time in hours-minutes-seconds, where the number system uses sexagesimal units (i.e. based on 60). Note the maximum value '5' in two of the columns. 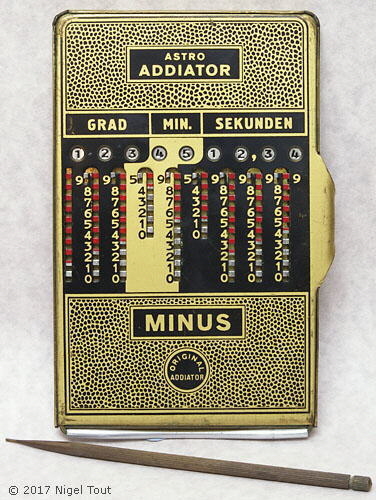 The machine is double-sided, with one side for addition and the other side for subtraction. In the photographs it is displaying the angle 123° 45' 12.34" or the time 123hrs 45min 12.34sec. 84 x 128 x 6 mm (3.3" x 5.0" x 0.25"). This version manufactured about 1938 - 1957. It is called 'Astro' since it would have been useful to Astronomers.